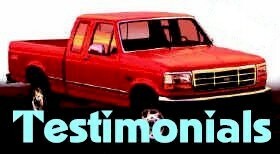 If you have enhanced the performance of your vehicle with one of our products, we'd like to hear from you...and we will feature your truck or motor home in the "Success Stories/Testimonials" section. You can even send a photo of your vehicle, and we will put it here for you to show to the world. We frequently hear stories from "full-timers" and other performance-minded drivers how a D-Celerator Diesel Exhaust Brake or a Unified Tow Brake has increased their driving enjoyment. Now you can let everyone know about the benefits of the D-Celerator or Unified Tow Brake. Here are some examples of the stories we hear regularly. For a year I towed a Jeep Cherokee behind my 37' gas motorhome and approached every stop light and intersection with a little trepidation. This spring I installed your Unified Tow Brake system and immediately felt the difference. Stopping is much more predictable. The product is worth the price just for the feeling you have when you know you can stop safely. A few weeks ago while returning home from trip, the alarm went off on the controller, I looked in the rearview camera and the Jeep was not where it was supposed to be. It was hanging on by the safety cables and the breakaway feature was applying the brakes to the Jeep. We were able to stop in a controlled fashion and the Jeep did not hit the back of the motorhome. What could have been a very bad situation was controlled easily by the Unified Tow Brake. I replaced the sheared pin in the tow bar and we were on our way. Thanks for making a great product. After comparing the D-Celerator exhaust brake with other exhaust brakes on the internet and magazines, I decided to install the D-Celerator by US Gear... I am extremely pleased with the way it assists in braking. The braking of the D-Celerator from U.S. Gear is very good even at lower rpm's. Once again, I would like to thank you for a very well designed product. I highly recommend the D-Celerator by U.S. Gear to anyone considering installing an exhaust brake on their pickup truck.